The Prologue's wide grille, thin headlamps and bulges above the wheels are elements that will appear on future production cars. 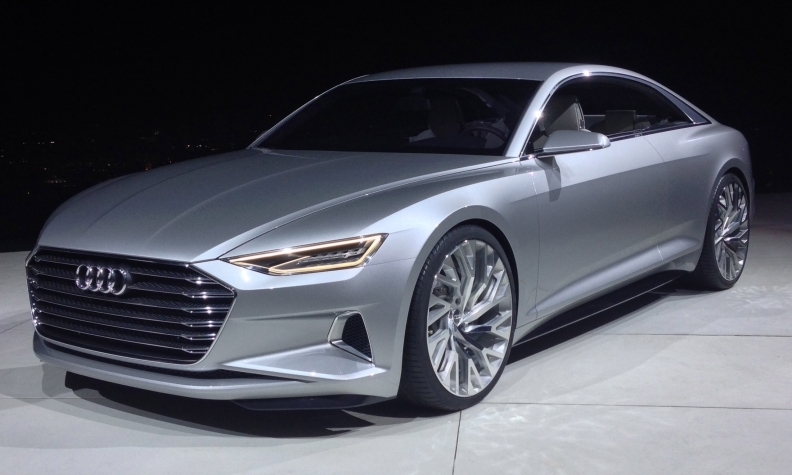 WEST HOLLYWOOD, California -- Audi's Prologue concept car embodies the future styling of the A6, A7 and A8 sedans, the automaker's new design chief says. At an event here in the hills above Los Angeles on Tuesday evening, Audi design chief Marc Lichte introduced the car and signaled the Prologue concept marks the start of a new era in styling for the luxury brand. The Prologue's design characteristics -- a wider and narrower grille, thinner headlamps, a fastback-style roofline, a low beltline and sinewy bulges above all four wheels -- are among the key elements that will appear on future production cars. "All of them will share parts of this car," Lichte said after the reveal. "Maybe the closest will be A7." 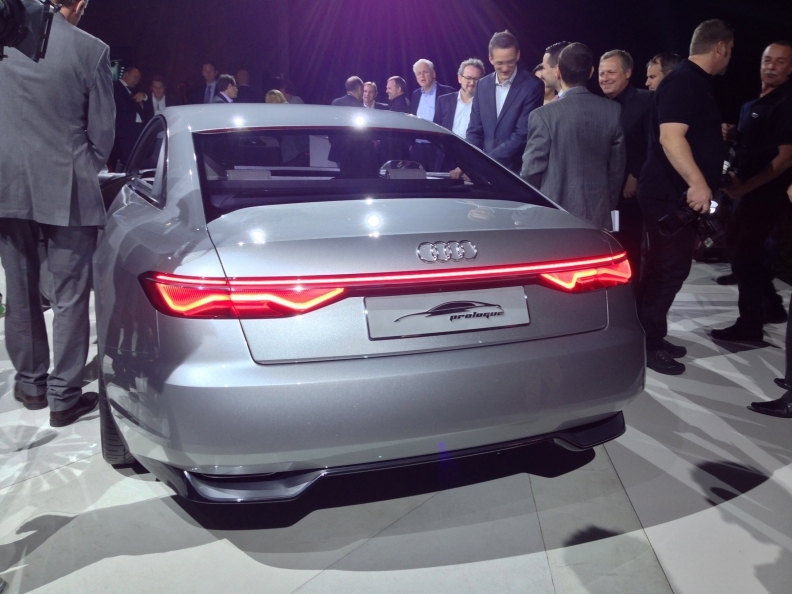 The Prologue is Lichte's first vehicle to be shown publicly since he took over as Audi's design chief in February after leading exterior design at Volkswagen. "Making technology visible in design is what it's all about," Lichte recently told Car Design News in discussing the concept. He and his team of 400 designers at Audi's Ingolstadt headquarters have already completed new designs for the A6, A7 and A8 from scratch, he said Tuesday. "The design is frozen and decided by the board," he said. Audi says the show car signals a new chapter of exterior and interior design on upcoming Audis that will also emphasize sportiness, lightweight design and Quattro all-wheel drive. “It’s a signature car for Audi,” Ulrich Hackenberg, Audi's head of development, said in a statement on the eve of press previews for the Los Angeles auto show. Under the Prologue’s hood is a 605-hp engine that propels the car to 100km (62 miles) per hour in 3.7 seconds. Lichte, 45, became Audi's design chief after former design boss Wolfgang Egger moved to the Volkswagen Group's Italdesign Giugiaro studio in February.